13th Annual Latin Grammy Awards are held on November 15 at the Mandalay Bay Events Center in Las Vegas, Alan Bise and Bruce Egre of Cleveland’s Azica records will be anxiously awaiting the results of their nomination in two categories for their recent release, Masters of Bandoneon. The disc itself has been nominated for Best Tango Album, and one of its tracks, Stringago by Carlos Franzetti, played by the Cuartetango String Quartet, has been nominated for Best Classical Contemporary Composition (listen to two of the tracks here). These nominations bring a relationship that began as a chance meeting between violinist and Cuartetango founder Leonardo Suarez Paz and Alan Bise to a fitting conclusion — at least for this recording project. Besides having a good time, the trip was also about work, and Bise did admit to being a little nervous during the fist recording session. “Recording the bandoneon is tricky because the sound comes out of both sides, and here I am with all of these famous players. But everyone was so nice and the musicians were very well prepared”. Masters of Bandoneon is Leonardo Suarez Paz’s tribute to Tango, its past, present, and above all, Astor Piazzolla and Nuevo Tango. In the album’s engaging liner notes, Laurie Schulman writes, “Suarez Paz comes by his affinity for Nuevo Tango naturally. His father is Fernando Suarez Paz, a veteran of several tango bands and string orchestras who became Piazzolla’s ensemble violinist in 1978. The younger Suarez Paz is a fourth generation tango musician.” Suarez Paz also states that although Piazzolla was the start of Nuevo Tango he was not the end, and this recording project showcases the principal musicians who are projecting his legacy into the future. 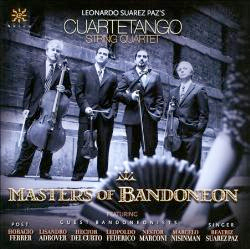 Masters of the Bandoneon is centered around the string quartet Quartetango, Leonardo Suarez Paz and Sami Merdinian, violins, Ron Lawrence, viola, and Danny Miller, cello, all of whom are excellent tango and classical players. Their classical training serves the quartet well in all of the album’s five tracks featuring the quartet alone. The Latin Grammy-nominated Stringazo by Carlos Franzetti [track 11] is indeed a standout, although I was also taken with Nester Marconi’s Cameratangos 3 [track 5]. The album’s five guest bandoneonists are some of the greatest living performers of the instrument: Lisandro Adrover (of Forever Tango fame), Hector Del Curto (arguably one of the finest young players today) Leopoldo Fedreico (one of the greatest players of all time) Nestor Marconi (a fantastic composer, teacher and player) and Marcelo Nisinman (an outstanding young composer and player). To have all five masters on one recording makes this album a must-have. Pianist Octavio Brunetti contributes wonderfully during Escula [track 6] by Pizzolla and El Tiempo Y Vos [track 7] by Suarez Paz. But the most touching moment is Balada Para Mi Muerte, [track 4] with music by Piazzolla, lyrics by Horacio Ferrer and arrangement by Saul Cosentino. The song features vocalist Beatriz Suarez Paz and recitations by Horacio Ferrer Piazzolla’s long-time collaborator and lyricist. It is here that the listener begins to understand the highly personal nature of the album. Hats off to Leonardo Suarez Paz for bringing everyone together. Masters of Bandoneon is the closest most of us will every come to being in the same room with this many legends of Tango!